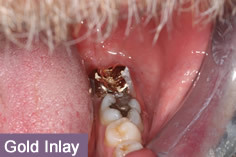 An inlay is a type of filling that is made in the laboratory and then bonded into the tooth to be restored to bring it back to its natural shape. 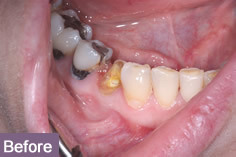 If a tooth is heavily broken down, a tooth coloured filling is not always strong enough to last very long, and if a lot of the existing tooth has been lost a crown may not be the best option. This is where inlays are ideal. Because they are made in the laboratory they can be carefully shaped to match the teeth before they are finally put in your mouth. They cost more than a simple filling but where indicated they provide a better solution. What are Inlays made from? Inlays used to be made from gold. A well made and fitted gold inlay is an excellent restoration which will last for a very long time. 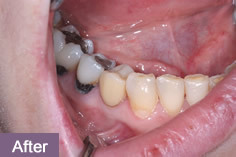 They are indicated where a lot of tooth substance is missing in the back teeth. Gold Inlays are very good restorations but a lot of people do not want a gold filling in their teeth which can be quite noticeable. So here at Hunts Cross we offer a choice of Tooth coloured Inlays. The first type which we have used for many years and routinely use in back teeth is made from a material similar to the white filling material (Composite) except that as it is made in a dental laboratory the setting process is different and it makes it a much harder more long lasting material. This type is suitable for most areas and as it is a composite it actively bonds to remaining tooth structure forming a very good restoration. The other type of inlay is made from Porcelain. This is a similar process, of preparation and manufacture the main difference is that the inlay is glazed porcelain rather than composite. In practical terms porcelain is more translucent, and has a shinier surface. The shade range is also wider so a more perfect match to the surrounding tooth structure is possible. Porcelain also will not wear away over time. The catch is that porcelain inlays do cost a lot more to manufacture so they cost more to provide. The procedure is similar to a crown, the tooth which is to have the inlay is carefully shaped, an impression is taken of the tooth which is sent to a dental laboratory. The laboratory makes the inlay which is then bonded into the tooth on a second visit. Well fitted inlays will provide a high quality tooth coloured restoration which will provide many years service if correctly maintained.